The Door-Buddy SAVES MONEY by allowing the user to hold the door open without bending over to place a traditional doorstop.This reduces injury costs due to back strain or improperly secured doors. The VERSATILE design makes Door-Buddy easy to use — a built-in rotator pin allows placement on 1/2" and 3/4" door hinge pins. Small enough to fit in a jacket or coat pocket, the Door-Buddy SAVES TIME because it's always close at hand. No time wasted trying to locate missing door stops. 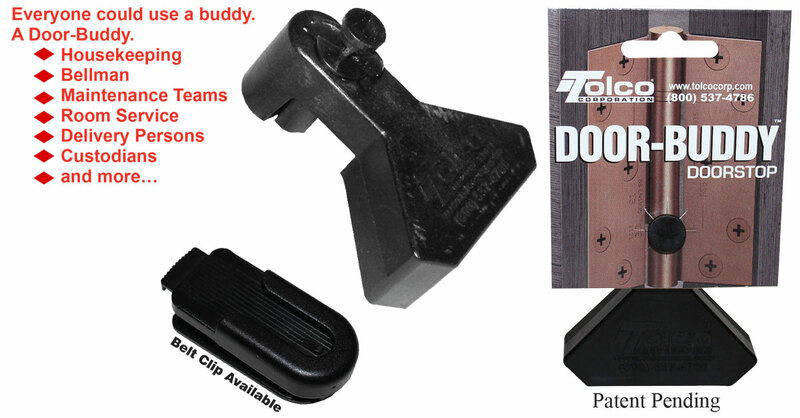 Door-Buddy DOESN'T SLIP — used over the hinge, the door is kept securely opened until you remove the Door-Buddy. Available with a CONVENIENT belt clip to that Door-Buddy is always readily available just when you need it. Packaged with a hang card for easy retail.